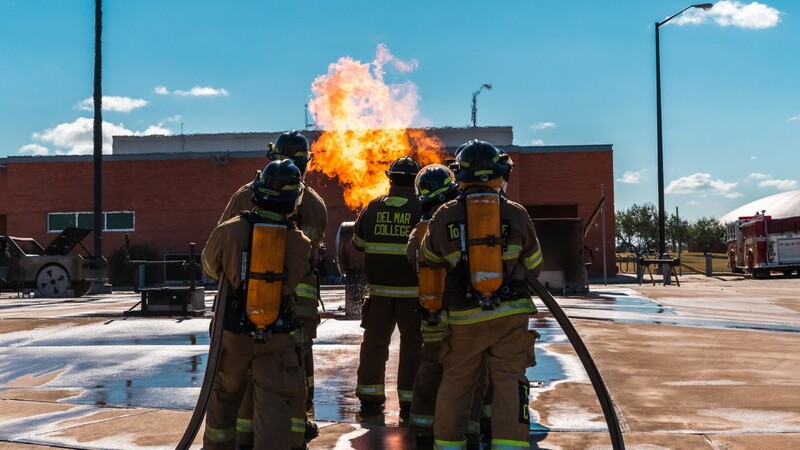 The Del Mar College Regional Fire Academy is designed to meet the training needs of the modern firefighter. To meet the growing emergency medical services responsibilities of the modern firefighter, the Academy also includes the Basic– Emergency Medical Technician courses in addition to the fire courses. The Texas Commission on Fire Protection requires a minimum of 471 hours in a basic firefighter academy. To ensure the success of our cadets as firefighters, the Del Mar College Regional Fire Academy is 724 hours in length. Since its inception in the Spring of 2001, the Academy has graduated over 200 cadets. Del Mar College Regional Fire Academy cadets have found employment with: Houston Fire Department; San Antonio Fire Department; New Braunfels Fire Department; Cherry Hill North Carolina Fire Department; Portland Fire Department; Aransas Pass Fire Department; Kingsville Fire Department and many other departments throughout South Texas, the state and the United States. The curricula of the Del Mar Regional Fire Academy meets or exceeds the standards promulgated by the Texas Commission on Fire Protection (TCFP). The curricula of the Fire Science program meets or exceeds the standards established by the National Fire Academy—Fire and Emergency Services in Higher Education (FESHE) committee. The curricula of the Del Mar College Fire Academy and Fire Science programs meets or exceeds national standards. Page last updated October 7, 2018.